These photo editing tips are basic and can become second nature to you quite quickly. Just make it a habit to edit the photos that are worth keeping and discard the rest. You can dramatically improve an ordinary or average photo and tweak it into a very good or sometimes stunning photo. I put this one first because I think it is one of the most underutilized ways to improve a photo. Modern day digital cameras are extremely good at getting exposure and color balance right most of the time. That leaves composition control as the most important aspect of your photography you can improve upon. If you don't get that composition just right in the camera, you can improve it with cropping afterward. Before you do anything else, experiment with cropping. Your cropping tool will allow you to come in closer to your subject and cut out some of the distractions in the background. Maybe your photo is off centered or the horizon is crooked. See if your editing software will allow you to move the cropping window around or tilt it. You can save different crops of the same photo. Just save them with a new file name each time. 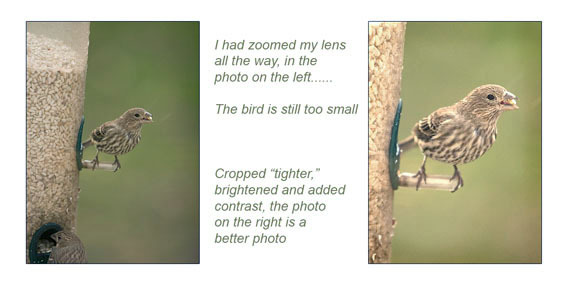 For more on cropping and resizing, visit this post: How to Resize. The other result of cropping is the new placement of the center of interest, the bird's eye and beak in this photo. Using Rule of Thirds in photography and other design and artistic endeavors improves the composition immediately. Sometimes you digital camera will not give you a perfect photo exposure. A very bright area of the photo my throw off the camera's averaging meter and cause underexposure. Photo editing software has either a brightness or exposure adjustment button or slider. In the outdoor portrait below, the only photo editing done was adjusting the saturation. For the definition of Saturation or any other photo words, go to Photography Definitions. You can see that the high saturation photo looks a little strange. The low saturation photo has a subtle, softer look to it. If you are not printing an enlargement to hang on the wall, consider adding some text. Most photo editing software programs have a text tool. You could add details like a place, date or person's name to your photo. You can edit with various sized wording that you can place anywhere on the photo. This is the last tip, but perhaps the most critical. You don't want to accidentally overwrite your original photo with the edited version of it. After you download your digital photos to your computer, you most likely will have file names consisting of zeros and other random digits or letters. Be sure to rename the files ("save as") so that they make some sense. "Chicago-Sunset-2019-brightened.jpg" is easy to recognize. The original file name "IMG_2437.jpg" looks like computer's system files and doesn't help you when you want to recognize or organize your photographs. These are just a quick, few photo editing tips to enhance your digital pictures. There are more advanced tips on taking digital photography editing to whole new level in other articles. As always the most important digital photo tip of all is to have fun with your photography. Digital Photo Editing Software. Tips for helping you choose the best digital photography editing software for you to use. 4 Basic Photography Tips. The 4 basic photography tips in this article will help you avoid spending lots of time editing bad photos. Discover how to take better photos using the secret CLEF Formula. You can share these photo editing tips with someone you know by using the social bookmarking links on the right. 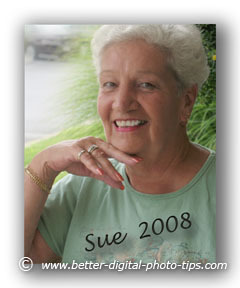 You can also ask me any specific questions by the link on the Digital Photography Tips Home page. Improve your photography. Read reviews on the top Books on Photography Retouching. I hope these photo retouching tips give you some incentive to adjust your photos a bit before you post them on your favorite site or save them in a folder. We live in an amazing time with respect to the possibilities we have in front of us with photography.